Steve Wartman and his crew have almost finished the basement remodel, and I’ll be writing a comprehensive post to unveil the transformation soon. 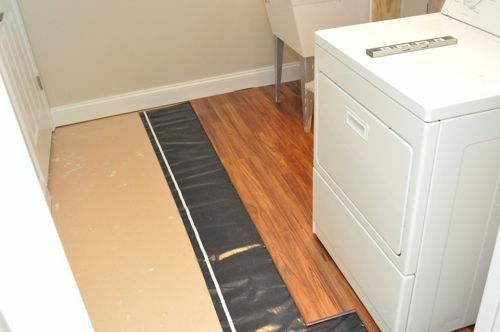 Installing flooring is one of the last phases in the process, and the homeowners have opted for a floating laminate floor in the laundry room. 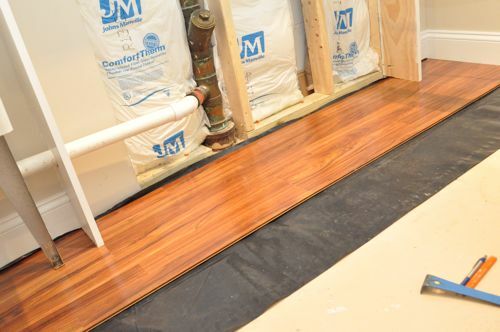 Floating floors are a great DIY project because the work goes fast, and since a floating floor isn’t nailed down, they don’t require as many tools as a traditional wood floor install (see our How to Install Hardwood Flooring article for more details). 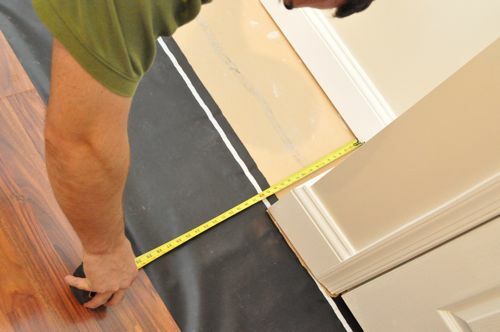 Plus, floating floors can be laid over virtually any material—concrete, plywood, sheet vinyl, and more. 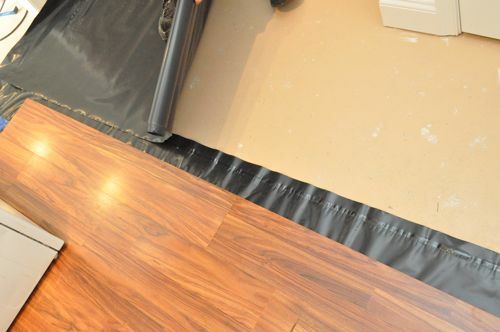 Today’s article walks you through to process for installing a floating laminate flooring over a concrete subfloor. Using Peel and Stick Tile? Check out peel and stick tile tips from A Step in the Journey. Laminate flooring: Laminate flooring in an engineered product consisting of a durable laminate surface, a wood based core and a backing. 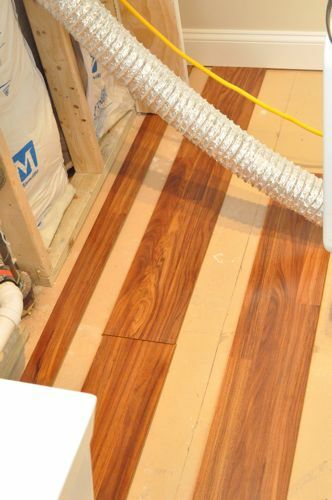 This install is utilizing Pergo brand flooring which features interlocking tongues and grooves that snap together and a pre-attached foam underlayment for sound reduction. 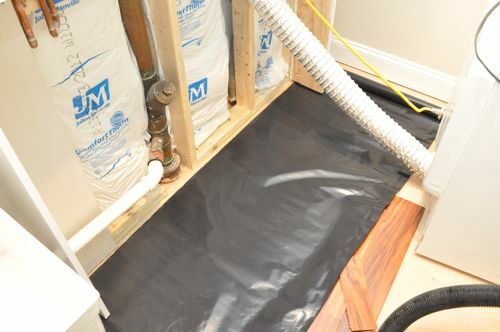 Plastic underlayment: This floor is being installed over a concrete subfloor, and since concrete is constantly releasing moisture, a vapor barrier is necessary. The guys are using a 6-mil. 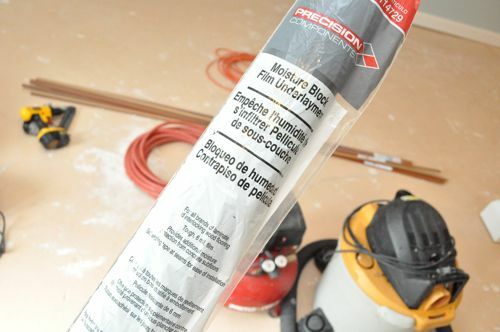 resin polyethylene film to provide that barrier. These are the tools that were used for this particular install; however, some tools are interchangeable. 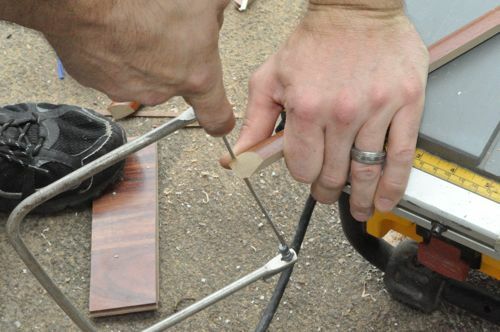 For instance, you can use a hammer and nail-set instead of a finish nail gun and compressor. 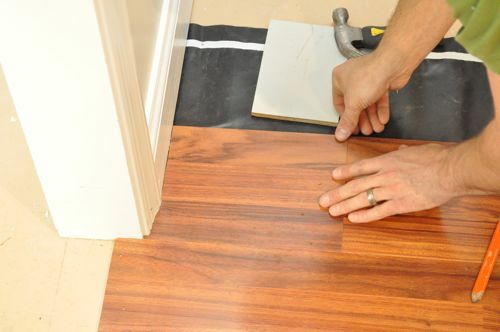 Before Steve’s crew began laying the floor boards, they started by checking the subfloor with a level. It’s important that the concrete is relatively flat (less than 3/16″ over 10′), without humps or voids. Fortunately, this subfloor is in good shape. If that were not the case, the guys would have needed to fill low areas and/or grind down high areas. 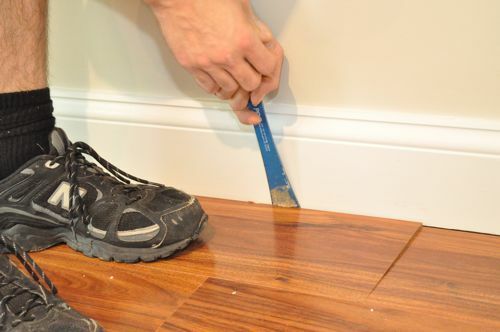 Pro-Tip: Self-leveling cement is a great way to address an uneven subfloor. Check out Fred’s experience on his article about using self-leveling cement over a concrete slab. Steve’s crew also carefully cleaned the subfloor to remove dirt and debris. 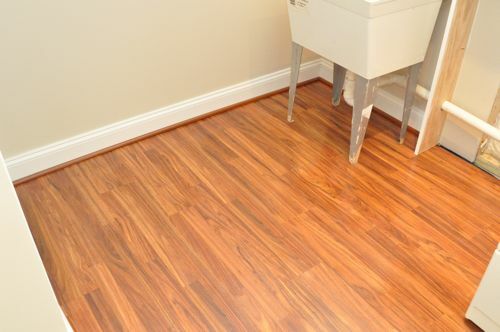 Even though laminate flooring is an engineered product, it still expands and contracts with changes in moisture. For that reason, it’s important to acclimate the flooring before installing. Otherwise, the floor may buckle or gaps may appear. 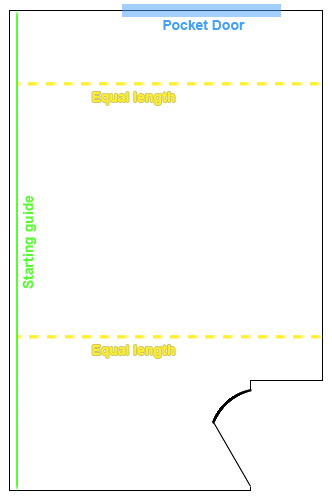 Pergo indicates to leave unopened boxes flat on the ground for 48 – 96 hours prior to installation. Since most spaces are not 100% square, it’s important to create guides so that the planks stay parallel and look uniform. Even though the guys will start laying boards along an exterior wall, the interior wall is most visible, and it’s from the interior wall that they measure. After marking out an equal length, Steve’s crew uses an 8′ level to scribe a straight line that will serve as the starting point. 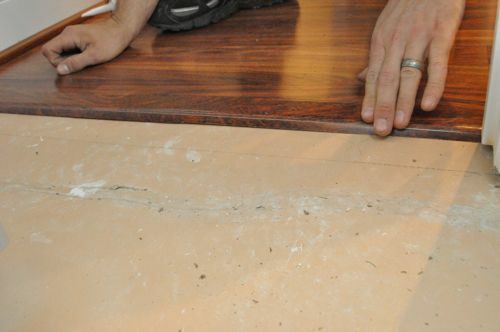 Since the floor will be covered with plastic, they transferred these marks to the adjacent baseboard and framing. 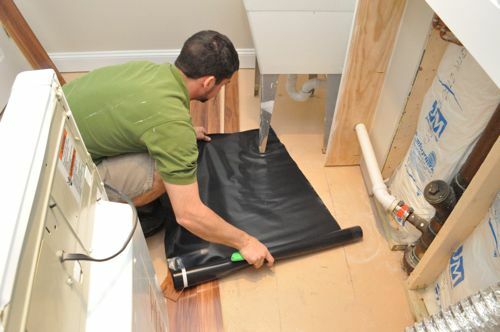 Next, Steve’s crew unrolled the plastic sheeting, running it tight against the walls. Each course overlapped by a couple of inches, and the sheeting included an adhesive strip for joining subsequent rows. The first row of this installation was unique because the guys were working around a utility sink, a dryer and some custom shelving. For that reason, they locked a few rows together before moving them into place using their guide marks. They oriented the boards with the tongue-side against the wall, and that made laying the last row easier. If you’re looking closely, you’ll notice that the first row of planks has been cut with a table saw to about 1/2 the width. The guys did this so that the last row of planks was a moderate width. 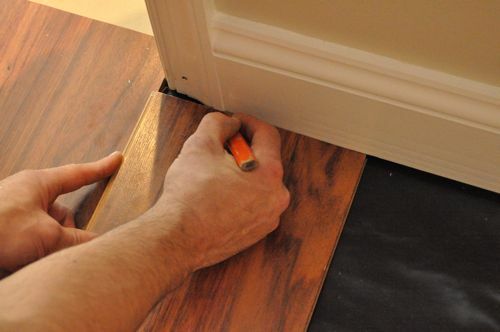 It’s important to maintain a 1/4″ gap around the entire perimeter of the floor to allow for expansion and contraction, and the gap underneath the baseboard will provide that space. 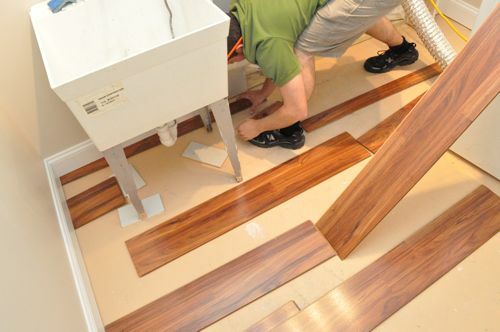 Steve’s crew used a miter saw to trim planks to length, working to avoid pieces shorter than 10″ or so. They also took care to space out the joints between adjacent rows. At doorways, the guys used a multitool and a piece of scrap to trim the door jamb to height. length underneath the door jamb. With those measurements and some back-and-forth to test for fit, the finished piece looked like the picture below. This was a time-consuming process because these boards will not have any shoe molding to conceal gaps. They needed to be sized just right. 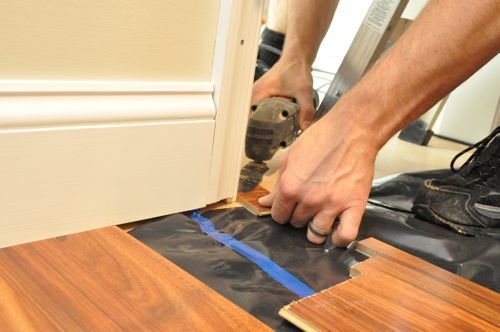 A nice benefit of locking tongue and groove flooring is that you’re not wrangling a toe-nailer into place. When the guys got to the last row, they ripped the boards to width on a table saw and slid them in place using a small pry bar. Next, Steve’s crew installed shoe molding around the perimeter. They would cope cut the inside corners and make 45° miter cuts for the outside corners. Pro-Tip: For more details, check out our article on how to cope inside corners. They also capped the shoe molding with these nice little returns, secured with a couple of pin nails. For the shoe molding, the guys used a finish nail gun, driving the nails into the baseboard (not the flooring). Lastly, the guys installed thresholds at the two doors, and there are a few different options depending on the situation. 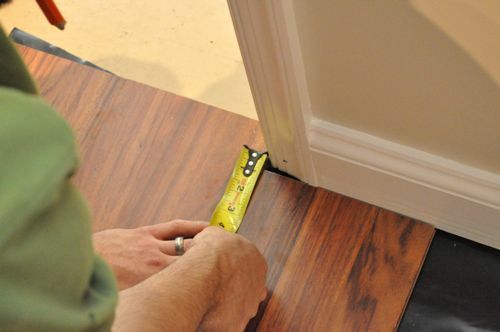 The first threshold was a transition from Pergo to carpet, and they glued a piece of t-molding in place. 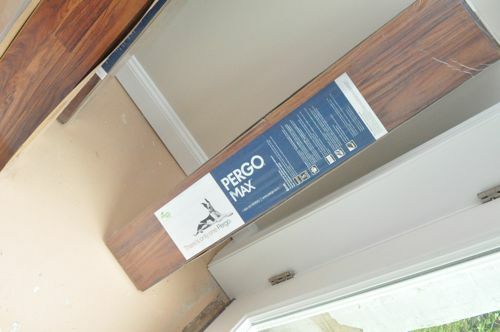 The second threshold was a transition from Pergo to an unfinished space, and the guys used the same t-molding with an insert to fill the unfinished side. In one short day this floor is complete, and it looks beautiful. Has laminate improved over the years or does it just come in a variety of flavors from cheap to high quality? it seems like the laminate floor in my wife’s condo scratches if you look at it funny. 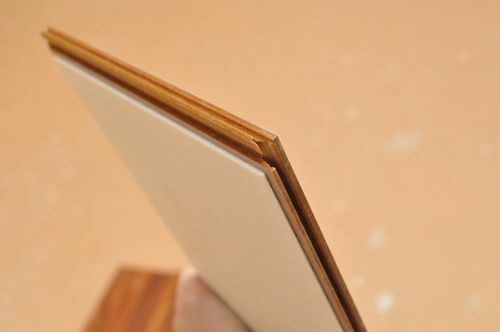 I’ve shopped laminate from multiple vendors over the past couple of months and it appears laminate has improved overall over the years, but yes, there is a HUGE variety in quality. I did a job with this particular brand of flooring back in October of last year, and put some of the scraps together in my shop in front of one of the benches that I regularly stand at to do wood procedures just to test the durability. I have not babied it at all, and in fact it has experienced drops(tools, as well as wood), and the dog coming to see me, and has held up amazingly well, no real scratches, or dents. All in all I am impressed with the quality, and would recommend it to other clients. 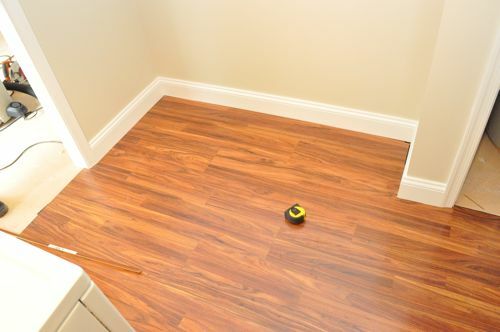 Are there any engineered flooring products with a similar snap together assembly? I prefer the look, feel, and sound of engineered wood flooring over laminate. We’re on a slab, and I really don’t want to glue the stuff down. I like the way the Pergo flooring has the foam backing already on it, too. Is that a proprietary thing? I don’t think that is proprietary. Several of the floors at Lumber Liquidators have the foam backing already affixed. Can you get this kind of laminate in non wood patterns? We have hardwood through out our house, but our kitchen is currently old terrible laminate sheets. I would love to replace it but I don’t think that we should put a different type of wood down. I gotta assume it’s out there since the wood pattern is just a fabricated image. While wood grain is very popular, I’m sure some manufacturer has branched out into other patterns. I know exactly what you mean, and I don’t think it’s caused by poor installation. I think it’s just a by-product of some laminate flooring. This floor didn’t sound bad, but it had a little give when you walked on it. You could feel that it wasn’t a solid wood floor. That’s good to know. I can handle the give, just not the sound. Real wood floors are too much money for right now so I am looking into laminate more and more. 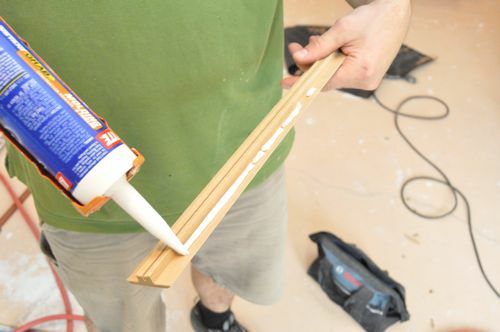 I see that you installed this with the existing baseboard moulding still in place. 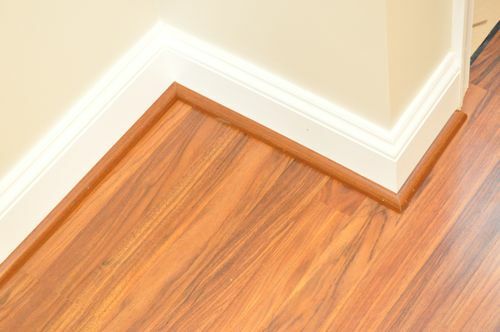 Did you tuck the ends of the laminate floorboards under the baseboard or are the ends flush with the face of the baseboard? I’ve got a couple of rooms to do and I really want to avoid having to pull the baseboard off the walls. This contrator ran the floorboards right up to the baseboards for most of the room. He did tuck them underneath the door jamb so there was no visible gap. beautiful wood floors! 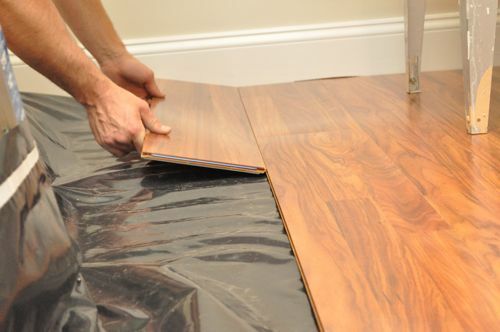 Thanks for posting the steps on how to install laminate floors properly. Ethan, it’s clear you’ve put some effort into this post and kudos for that. 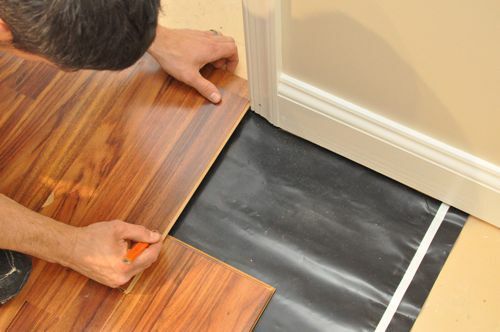 However, you’re showing people how to install the floor incorrectly. I mainly cite expansion allowance. 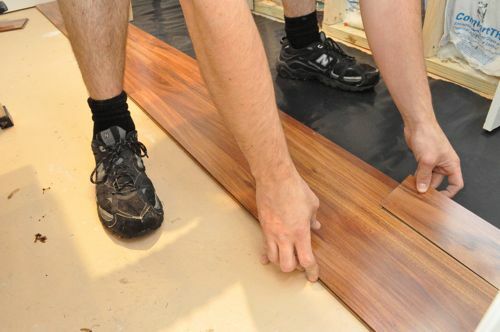 Without expansion allowance, as the humidity rises, the laminate will have nowhere to go and buckle. Perhaps the coefficient expansion rate is low and the humidity levels stable year round on this job, but it’s still installed incorrectly and isn’t a good ‘how to guide’. You’re aware of expansion and contraction with your brief acclimating advice but this is relevant on a seasonal basis. 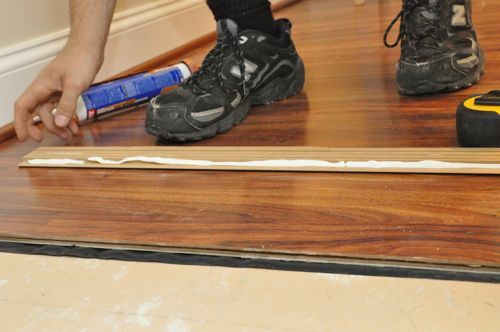 I’ve replaced or repaired many wood/laminate floors that had failed due to this. It’s clear it wasn’t you that did the install but I’d perhaps consider clarifying and editing the post. I don’t expect this post to be allowed in the comments section but felt the need to write it for your benefit. 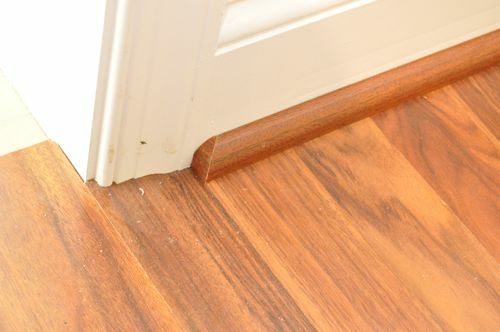 It looks like possibly the tops of the laminate are low enough to go under the baseboard if/when expansion occurs, but it is hard to tell. 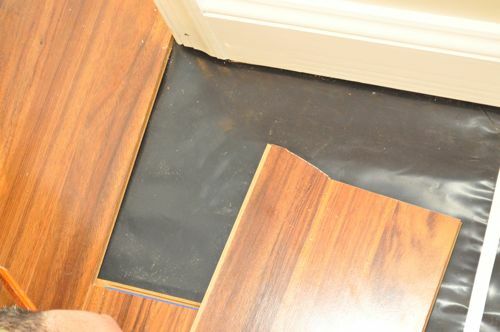 And expansion allowance definitely needs to be addressed in a how-to guide for laminate floor installation. 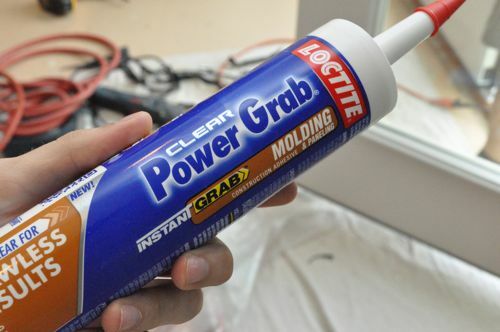 Also, I’ve read the T-molding shouldn’t be used when transitioning to carpet, since the carpet doesn’t offer much support, leading to cracked molding. 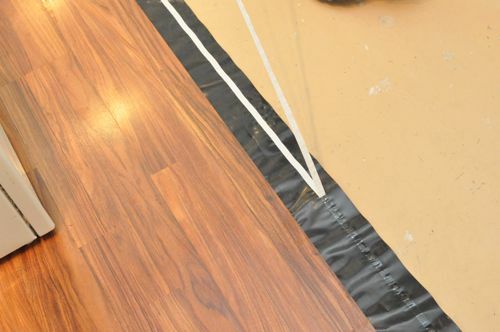 How big of a space can you lay a floating laminate floor? I want to do three rooms that connect and run about 35 feet. Is it okay to have it run a span that large? 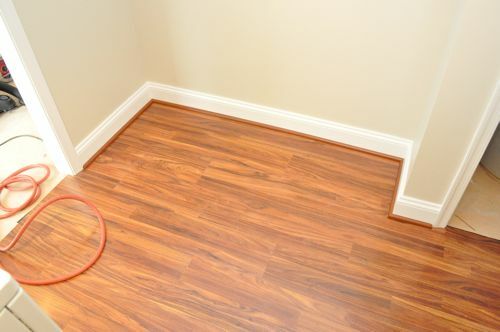 I had laminate flooring installed in a bedroom. It looks beautiful, but the installer used roofing felt for the underlayment/vapor barrier. When you walk on it, the floor makes noise because the felt sticks and then comes unstuck. I will have to have the floor removed and a pad put under it to cure the noise. Will this method work over carpet?